Police in Suffolk County, New York, are trying to figure out who installed crack pipe vending machines on public property after three such machines, dubbed “pen vending machines,” were recently found in the area. One of the machines was found outside the Fairfield apartment complex in Medford, while another was found near a bus stop in Coram. The third was found near the Coram Commons Shopping Center. Two of the machines were already partly destroyed by vandals before the police got to them. "Who in their right mind would even do something like that — to enable and to encourage somebody to do this?" Tony Gallo, a Coram resident, recently told Q13 Fox. "Did they really think they were gonna get away with this?" he added. 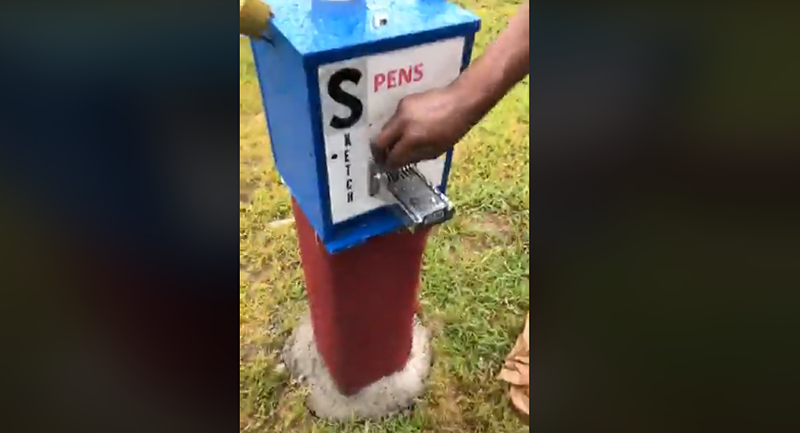 Resident Scott Malz took a video of one of the dispensers and shared it on Facebook Saturday. ​"I wanted the community to see what was going on and try to get rid of it as quick as possible," he said, "because that's actually a bad area for drugs," ABC 13 reported Monday. "We've been here for three years," Danielle Blom, a resident who lives in Medford, said. "We've never had any problems, and now this. So it's pretty disgusting." The blue and white vending machines, which were cemented into the ground, featured the words "Sketch Pens." However, the machines dispensed way more than that. Disassembling a $2 pen from one machine unveiled a small glass tube and filters — otherwise known as a crack pipe kit. As of Monday, all three crack pipe vending machines had been seized by officials. However, there could be more out there that have yet to be discovered. "You think you've heard of everything," Town of Brookhaven Supervisor Ed Romaine said said at a news conference Monday, Q13 Fox reported. "I continue to be surprised by some of the audacity of those that would break the law in promoting drugs and drug paraphernalia." "There are some people who think they're going to make some money out of this and prey on a community and promote drug use in a community. They're going to be sadly mistaken," he added. It has not yet been determined if the machines will result in criminal charges. "To sell a pipe is not illegal, but this is considered drug paraphernalia," Town Councilman Michael Loguercio said, ABC 13 reported. "And it also is being dispensed from a machine that was installed illegally per town code."